Our First Year in Review! With our one year anniversary just days away, we’re inviting you to take a look back with us at our first year in business. This collection of press releases, newsletters, and media articles follows Exhibit 5 from our inception in June of 2012 to today. It’s been quite a year, and we could not have done it without your support. Thank you for helping us grow! Attention Attorneys! Exhibit 5, Chicago’s newest digital court reporting agency has arrived. Chicago, June 2012: Exhibit 5, LLC, the latest digital court reporting agency to hit the Chicago market, launched today. Exhibit 5 offers clients videography services as an affordable, convenient, and technologically innovative alternative to traditional methods of court reporting, effectively eliminating the need for costly stenographers in legal proceedings. Exhibit 5′s free video service, price match guarantee, and referral rewards program are just a few of the agency’s unique offers that set it apart from its big-name competitors. Exhibit 5′s digital services are made available for a variety of legal proceedings, including, but not limited to depositions, arbitrations, and mediations. Primack and Sloan hope to curb the misconception that legal videography is too expensive and impractical an option for most proceedings. “We believe that taking advantage of technology is an important factor for success in the modern legal workplace, and thus we strive to keep our services both accessible and affordable,” Sloan noted. Exhibit 5, LLC is a Chicago-based digital court reporting agency established in 2012 by founders Brittany Primack and Erin Sloan. Exhibit 5, also known as e5, offers its clients legal videography services as an inexpensive, accessible, and technologically innovative alternative to stenography. e5 is a small, local business whose mission, above all else, is to provide its clients the most exceptional customer support. Check out Exhibit 5 in Crain’s Chicago Business! Exhibit 5: Founded by Brittany Primack and Erin Sloan, this Gold Coast startup offers videography services to lawyers. Exhibit 5 records video of legal proceedings such as depositions, arbitrations and mediations. The agency says a video record of deposition testimony can serve as a powerful litigation tool in the courtroom. Exhibit 5 also offers electronic, time-stamped transcripts, free exhibit filing and 24/7 access to a secure, easy-to-use online repository. Take advantage of our special summer promotion! For each new client you refer to Exhibit 5 who schedules a proceeding, you will receive your choice of a $100 gift card to Park Grill or $150 in free Exhibit 5 services. Plus, all new clients will receive 25% off of their first booking. * Schedule your next proceeding with Exhibit 5 today! Capulet vs. Montague. Sammy Sosa vs. Mark McGwire. Kanye West vs. Taylor Swift. Much like these storied feuds of literature and history, the enduring battle between stenography and electronic reporting rages on into the digital age as both sides refuse to relinquish their claims of superiority. Stenographers will argue that their extensive training in the art of shorthand reporting makes them uniquely qualified to capture testimony completely and accurately, but as a digital reporter, I couldn’t disagree more. birthday month and we’d like to invite you to join in on the celebration. In honor of her special day, we are offering a special birthday promotion all month long. Schedule a proceeding before September 30th, and receive 20% off, plus a dozen cupcakes hand delivered by the birthday girl herself. Thanks for making this month special. Save 20% & Receive a Special Cupcake Delivery! *Must mention this offer at the time of scheduling. Offer valid for attendance fees only. Exhibit 5 is pleased to announce the launch of our monthly newsletter series. Here you’ll find the latest e5 news, special offers, a taste of our blog, and much, much more. Be sure to visit www.exhibit5.com to schedule your next deposition today! of our delicious caramel apple cupcakes. For each new client you refer to Exhibit 5 who schedules a proceeding, you will receive your choice of a $100 gift card to Trader Joe’s or $100 in free Exhibit 5 services. In these trying financial times, it is no surprise that economic issues continue to dominate political discourse as we move into the 2012 election season. Whether you’re a Republican or a Democrat, independent or apolitical, it is impossible to ignore the fact that the implementation of our next president’s economic platform will have a major impact on the state of the nation for the next four years. Exhibit 5 is a proud supporter of breast cancer awareness. Click here to learn how you can lend support during the month of October. FACT: e5 makes low resolution videos available immediately after each proceeding for quick and easy download. High resolution, HD quality videos are always available upon request. FACT: Video court reporting is no longer just for evidence depositions and other special circumstances. With Exhibit 5, our inexpensive and accessible video services are perfect for any type of proceeding. FACT: You don’t need a stenographer present at depositions when you hire e5. We offer both services for the price of one. Treat of the Month – Cast Your Vote! In honor of the election, we are asking you to choose the treat of the month for November. For every deposition you schedule with us this month, your video court reporter will bring along the winning treat! *Check out our Facebook page to see the results. Polls will close Election Day at 6 p.m.
For each new client you refer to Exhibit 5 who schedules a proceeding, you will receive your choice of a $100 Lettuce Entertain You gift card or $100 in free Exhibit 5 services. We hope you are having a wonderful start to the holiday season! We’d like to take this opportunity to make a very exciting announcement. Exhibit 5 now offers conference room space for your proceedings. Conference rooms are available in Chicago and surrounding suburbs. Please contact our office for availability. And now for a limited time, we are offering complimentary legal video demonstrations for you and your team. Contact our office to schedule your free demonstration today! We wish you a safe, warm, and festive holiday! The Best of Winter in Chicago! We all know Chicago winters can be quite brutal, but as lifelong residents of the city, we at Exhibit 5 know a little bit about making the best out of this season. Click here to read more! Have something to say and no place to say it? Contact us today about being featured as a guest blogger! For every deposition you schedule with Exhibit 5 this December, your court reporter will bring along an assortment of holiday cookies. Is there a cookie you crave during the holiday season, but just can’t find the time to make it? Send us the recipe, and we’ll do our best to add it into the mix. Email us at info@exhibit5.com. For each new client you refer to Exhibit 5 who schedules a proceeding, you will receive your choice of $100 in free Exhibit 5 services or a three month subscription to e5′s cheesecake of the month club. Not sure if legal videography is right for you? Contact us today for a free demonstration. NEW REASONS TO TRY e5. We would like to take this opportunity to not only wish everyone a Happy New Year, but to also thank you for making 2012 such an amazing year for Exhibit 5. With your support, we’ve become one of the city’s most established digital reporting firms in only a few short months, and we’re just getting started! New to Exhibit 5? We offer legal video and electronic transcript services to Chicago area attorneys. Visit our website to learn more. For each new client you refer to Exhibit 5 who schedules a proceeding this month, you will receive $100 in Exhibit 5 services or a $100 gift card to Corepower Yoga so that you can start the year off right! Start referring us today! Above all, our goal remains providing our clients a superior customer service experience. Each month, we offer a different homemade treat to help you stay full and focused throughout your proceedings. This January, we’ll be bringing a healthy, but delicious snack to keep you on track with those New Year’s resolutions: Power Muffins! Schedule with us today. Win great prizes this Valentine’s Day. Support our Social Media Efforts. In the spirit of Valentine’s Day, we are asking for some love from you! Like us on Facebook this month, and be entered for a chance to win great prizes! Check out our Facebook page on February 14th to see if you’re a winner! Refer e5 during the month of February, and you’ll receive a $100 gift card to Mariano’s or $100 in e5 credit. Remember to check out our blog and other social media pages to stay on top of all of e5′s new and exciting offers. Not only are we giving away gifts and announcing our treats every month, but we’re also working hard to keep you up to date on the latest happenings in the Chicago legal community. Like Us! For every deposition you schedule during the month of February, your legal videographer will bring along mini red velvet and oatmeal chocolate chip cupcakes. Schedule Today! Go Paperless with Exhibit 5. Help support our eco-friendly initiatives this March and go green with Exhibit 5! Choosing e5 means minimizing your firm’s paper consumption, as our internet repository serves as an electronic filing resource for your documents. Check out our website,www.exhibit5.com, to learn more! Dine Green! For each new client you refer to Exhibit 5 who schedules a proceeding this month, you will receive $100 in Exhibit 5 services or a $100 gift card to Frontera Grill! For every deposition you schedule during the month of March, your videographer will bring along green, chocolate covered popcorn! With St. Patrick’s Day right around the corner, it is only fitting that we take this opportunity to talk about an aspect of Exhibit 5 of which we are very proud: being green! Our unique, paperless approach to court reporting differentiates Exhibit 5 from much of our competition. Read more. Exhibit 5 is court reporting reinvented. Our unique video solutions provide clients more opportunities to win their cases than traditional means of reporting. Whether using deposition video to impeach a witness in trial, demonstrate a witness’s body language, or verify the reliability of transcripts, our clients use Exhibit 5 to gain a winning edge in their cases. Schedule your next deposition with Exhibit 5 Digital Court Reporting today! For every deposition you schedule during the month of April, your legal videographer will bringalong mini carrot cake cupcakes. Refer e5 during the month of April, and you’ll receive a $100 gift card to David Burke’s Primehouse or $100 in e5 credit. Receive 10% off your first scheduled proceeding. Offer Expires 07/01/2013. Not valid with any other offer. Exhibit 5 is redefining Chicago court reporting. Our innovative, yet affordable digital solutions offer clients more opportunities to win their cases than ever before. And now, we are expanding our services to include video text synchronization and video editing for trial presentation, as well as digital will signings. We hope these new services, in addition to our unique to the industry, two in one court reporting and videography service, encourage you to take advantage of all that e5 has to offer.Learn More. Spring into Savings with e5! First time clients, receive 20% off reporter attendance fees with your first scheduled proceeding. Refer e5 during the month of May, and you’ll receive a $100 gift card to Whole Foods Market or $100 in e5 credit. If I’ve learned anything since we first opened e5′s doors in the summer of 2012, it’s that many attorneys are creatures of habit. Read more. Exhibit 5 is redefining Chicago court reporting. Our innovative, yet affordable digital solutions offer clients more opportunities to win their cases than ever before. And now, we are expanding our services to include video text synchronization and video editing for trial presentation, as well as digital will signings. We hope these new services, in addition to our unique to the industry, two in one court reporting and videography service, encourage you to take advantage of all that e5 has to offer. Learn More. If I’ve learned anything since we first opened e5′s doors in the summer of 2012, it’s that many attorneys are creatures of habit. The idea of making the transition to digital court reporting or even scheduling with a different stenographer is out of the question for some. Perhaps this unwillingness is out of a sense of loyalty to a particular reporting firm, but in the event that it is not and you’re simply weary of trying something new, I’d like to offer a guide to using e5 in hopes of allaying any concerns about going digital. Scheduling a proceeding with Exhibit 5 couldn’t be easier. Simply visit our online scheduling page here, SCHEDULE NOW, call our office at 312.945.7784, or send an email with your scheduling request to info@exhibit5.com You will receive an email confirmation following your scheduling, as well as another email 24 hours before the proceeding as a reminder. Your digital court reporter will arrive, with snacks in hand, approximately 30 minutes before the scheduled proceeding. To start, the reporter will make a brief introduction and swear the witness. From there, you are ready to go! Your reporter is available throughout the deposition to replay any testimony, mark exhibits, and help keep you organized if you require any additional assistance. Within 24 hours of the proceeding, you will receive an email from an Exhibit 5 representative notifying you that your video and exhibits are now available to download from our website, www.exhibit5.com. Simply log in with your username and password provided at the time of scheduling to access your video and exhibits. At this time, if you would like to order a transcript, simply click the order button on the right of the screen. You will receive an email confirming your order shortly after it is placed, and your transcript will then be prepared straight from the video record. Standard transcript delivery is seven to ten days. Faster turnaround options are available for an extra charge. Once your transcript is complete, you will receive notification via email that your transcript is available to download from our website, www.exhibit5.com. Simply log in with your username and password to access your transcript. We are also happy to visit your office at any time and provide a free demonstration to ensure you’re completely comfortable with our process. If you are interested in additional services, including video editing, video text sync, or conference room space, please contact our office. Go Green with Exhibit 5! With St. Patrick’s Day right around the corner, it is only fitting that we take this opportunity to talk about an aspect of Exhibit 5 of which we are very proud: being green! Our unique, paperless approach to court reporting differentiates Exhibit 5 from much of our competition. Although we understand the legal industry requires quite a bit of paper consumption, we have made it a core tenant of our business to minimize wastefulness. Consequently, we have designed our internet repository to serve as an electronic filing resource for our clients, as opposed to providing paper copies of all documents. Upon scheduling with Exhibit 5, each new client receives a unique username and password that enables them to access this repository. Once logged in, clients find their videos, transcripts, and exhibits filed by case. We find this system to be a secure, easily accessible resource that not only keeps our clients organized, but also helps us remain committed to being green. Exhibit 5 makes both transcripts and exhibits available to our clients in PDF format. Transcript orders come with a fully searchable, full-sized PDF transcript, as well as a condensed version, ASCII, and clickable word index. Similarly, all exhibits are scanned and filed electronically alongside each proceeding. We apply OCR, optical code recognition, technology to exhibits, making them full searchable and enabling clients to quickly locate key points in a document. We find that the benefits of these electronic documents far outweigh their paper counterparts. So in the spirit of St. Patrick’s Day, help support our eco-friendly initiatives and “go green” with Exhibit 5! Happy New Year from Exhibit 5! We at Exhibit 5 will always look back at 2012, our inaugural year, with the fondest memories. In just a few short months, we’ve become one of the city’s most established digital reporting firms, and we’re just getting started. Our mission remains to provide the highest quality legal video and electronic transcript services for a fraction of what our competitors charge. We are determined to make digital reporting the standard in Chicago’s legal marketplace. Above all though, our top priority remains providing our clients a superior service experience, and so we’ve recently made a few additions to Exhibit 5 in order to accommodate any additional needs you may have in 2013. In an effort to better serve our clients in the New Year, we’ve expanded our network to include a range of trusted legal service vendors to fulfill any additional requests you may have. Whether you’re in need of a document printing service, trial preparation assistance, an interpreter, or even a stenographer, we can help refer you to a vendor who offers the same great service experience you’ve come to expect from Exhibit 5. We hope our referral list helps you feel confident in knowing that you are choosing a vendor that has our stamp of approval. In addition, as a member of the Small Business Advisory Council, Exhibit 5 can now offer conference room space for your depositions in Chicago and surrounding suburbs. If you are interested in taking advantage of this new service, please contact our office for locations and availability. Still not convinced that Exhibit 5 or digital reporting is right for you? Then try a free demonstration with the e5 team! Throughout 2013, we will be offering complimentary legal video presentations to potential clients. Be sure to contact our office to set up your appointment today! Erin and I would like to take this opportunity to thank you for making 2012 such a great year for Exhibit 5. We could not have done it without your support. We wish you all a safe, healthy, and happy New Year! We all know Chicago winters can be quite brutal, but as lifelong residents of the city, we at Exhibit 5 know a little bit about making the best out of this season. Whether you’re looking to escape the cold or embrace it, Chicago offers a variety of unique and fun winter activities. Check out our list below, and let us know how you like to spend your winter in the city! Christkindlmarket: The Christkindlmarket, held annually in Chicago’s Daley Plaza, offers patrons a chance to nosh on delicious German fare while shopping for uniquely charming holiday gifts. Don’t miss the spiced wine! Zoo Lights: Head over to Lincoln Park Zoo, and check out the amazing holiday lights on display through January 6th. It’s free holiday fun for the whole family! Best Hot Chocolate in the City: Escape the chill, and stop in to Mindy’s Hot Chocolate for a creamy and decadent cup of warm, chocolaty goodness. Don’t miss the pumpkin hot chocolate! Your taste buds will thank you. CTA Holiday Train: Take a break from your ordinary commute, and hop on the holiday train for a fun and festive travel option this winter season. Best Soup in the City: There’s nothing better than a hot bowl of soup to beat the chill on a cold Chicago day. Soupbox, with locations in the Gold Coast and Lakeview, offers patrons a delicious variety of fresh, piping hot soups. Be sure to pair yours with a grilled cheese sandwich! Jingle Bell Run/Walk for Arthritis: Get in the spirit this holiday season by giving back! Sign up for the Jingle Bell Run/Walk for Arthritis on December 15th or simply make a donation to the Arthritis Foundation. It’s a fun way to get the entire family involved in supporting a great cause. 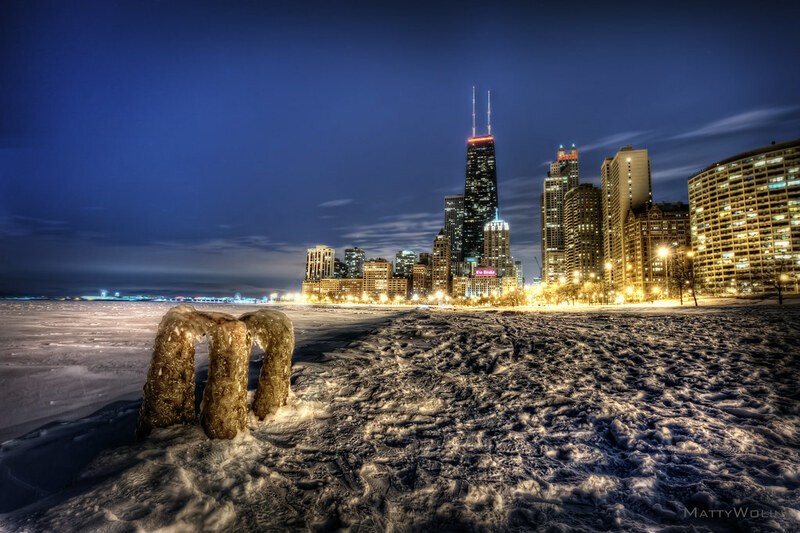 Chicago offers a variety of unique ice skating options with a view, the best of which include the Rink at Wrigley, the McCormick Tribune Ice Rink at Millennium Park, and Skating in the Sky at the John Hancock Observatory. How Has Social Media Marketing Impacted Your Business? I’m an open-minded skeptic. As such, I’ve been flooded with ideas for advancing Exhibit 5, but hesitant to commit to anything in particular, specifically with regard to social media. I suppose my hesitation is rooted in the question of whether businesses actually engage with their social media or if having a Facebook or Twitter page has simply become a useless, but obligatory token of the internet age. As a small business owner with limited resources, determining whether or not an investment in social media will provide any substantial return is vital. Thus far, our attempts at engaging our desired audience, specifically other businesses, via social media have produced mixed results, furthering my skepticism regarding its effectiveness as a marketing tool. In spite of my doubts, I’m not prepared to give up on social media as a business tool quite yet. To be fair, I’m no expert on any one particular social media platform. Managing Facebook, Twitter, LinkedIn, Google+, and a blog all while running a small business is a lot to take on. And so that got me thinking, perhaps it is not that social media is an ineffective means through which to generate business, but rather, it could be that we have not been using these mediums to their full potential. In order to test this theory, Erin and I decided to take advantage of some of the programs offered as part of Crain’s Small Business Week, many of which involved the use of social media in business, to learn how to utilize these platforms more effectively. Having used social media in a personal capacity for many years, I doubted that I would learn anything substantial from their experts. I’m happy to report, however, that I did come away with more than anticipated. While I don’t believe social media can ever act as a substitute for personal interaction, it does appear that active and consistent social media participation can be a useful component in any small business’s marketing strategy. Not only can social media act as a bridge for introductions to potential clients, but often more importantly, social media allows us to form strategic partnerships with individuals whose networks inevitably expand our potential client base. Thus far, we’ve found that active engagement with our connections, on LinkedIn in particular, has afforded us many great opportunities to introduce ourselves to potential clients and to tell them a little bit more about Exhibit 5 via wall posts and private messaging. We’ve already had some success in turning such connections into promising business relationships. The key to success with regard to social media’s effectiveness as a marketing tool, however, does appear to be a commodity in short supply for most small business owners: time. As we continue to make efforts to increase the time we spend engaging with social media, we’d like to pose the following questions to our readers in hopes that we can all learn a little bit from each other’s experiences: Is your business active in social media? What sort of time and resources do you allocate to your social media efforts? And finally, have you seen any noteworthy returns on your investments in social media? In these trying financial times, it is no surprise that economic issues continue to dominate political discourse as we move into the 2012 election season. Whether you’re a Republican or a Democrat, independent or apolitical, it is impossible to ignore the fact that the implementation of our next president’s economic platform will have a major impact on the state of the nation for the next four years. And while it is certainly important to assess the significance of such macro-level policies on one’s personal well being, I invite you to take the time to consider how choosing to patronize a small business like Exhibit 5 can positively and directly affect your personal circumstances. Therefore, much as both presidential candidates will spend the next few months professing the obligatory campaign promise of a better future, we at Exhibit 5 would like to take this opportunity to put forth a set of our own “campaign promises and platforms” in hopes that when deciding which court reporting firm to use for your next proceeding, you will choose Exhibit 5! A Vote for Exhibit 5 Will Save You Money! Above all else, Exhibit 5 is committed to remaining a cost-effective alternative to traditional methods of court reporting. As success in the modern legal workplace becomes increasingly dependent upon one’s ability to take advantage of technology, we believe no one should be precluded from choosing digital solutions due to exceedingly high costs. With this in mind, we strive to keep our services both affordable and accessible. Unlike most agencies who often charge hundreds of dollars for their video services, Exhibit 5 offers its clients a FREE video with every proceeding, available 24/7 on our secure and easy to use online repository. And with Exhibit 5′s price match guarantee, you will never pay more for our transcript services. In fact, we are so committed to keeping our rates low that if you’ve used a cheaper videography or stenography service in the past, we will gladly match their rates. So if you’re looking to save some money for yourself and for your clients, choose Exhibit 5! A Vote for Exhibit 5 is a Vote for Small Business! Exhibit 5 is a small, local business dedicated to serving the Chicago legal community. As such, we believe we are uniquely qualified to provide our clients a level of care and attention that just cannot be matched by our big-name competitors. Furthermore, in today’s somewhat unstable economic climate, it is now more important than ever to patronize small, local businesses like Exhibit 5 given that this support plays a major role in stimulating the city’s economic growth and its residents’ individual prosperity. A Vote for Exhibit 5 is a Vote for the Future! At Exhibit 5, we believe that the success of our community depends largely upon the investments we are willing to make today to ensure a prosperous future. Consequently, we’ve made it part of our mission to support technological innovation in the court reporting industry, as well as to implement environmentally friendly practices within our business model. We hope that our commitment to the expansion of innovative digital solutions, coupled with our practice of offering only paperless transcripts will one day have a large scale, positive impact on our community. And so, although we won’t be on any actual ballots this November, we do hope you’ll take the time to consider choosing Exhibit 5 for your future court reporting needs. Jim Scordo on Our First Year in Review! Court Reporting Blawgger on How Has Social Media Marketing Impacted Your Business? bprimack on Vote for Exhibit 5!! Tony Wright on Vote for Exhibit 5! !